Cool Hawaiian Palm Tree Freestanding Tropical Tabletop Real Neon Art Sculpture FREE SHIPPING!! Tired of all the 'typical' neon palm trees you see EVERYWHERE? Well, I designed this unique one, inspired by old Hawaiian photos and drawings of stylize palms. Approximately 26" high overall, including base. This is a hand-made, original design, real neon art free-standing sculpture. The neon tube 'plugs into' a black resin base. Note: the second photo showing the Palm in 'lighter' colors is to illustrate how it looks on the base, and the neon color is NOT accurate in that photo. This piece is my personal design and is hand made by me here in Southern Arizona. High quality neon tubes like this do not 'burn out' like incandescent or fluorescent bulbs. With a minimum of care, this piece will last many years. This piece ships in approximately 2-3 weeks. If you are concerned about shipping neon glass, we pack our neon individually with great care. In the unlikely event that your neon piece gets broken during shipping, we immediately make another piece for you, and file a claim with the shipper, so there is no loss to you. Like any lamp that incorporates real glass and electricity, this piece is not meant for children. 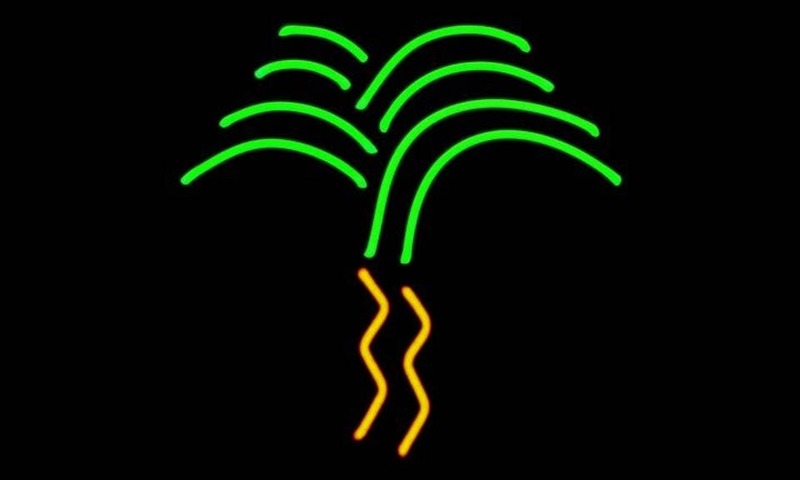 Cool Palm Tree Neon Art Sculpture FREE SHIPPING! Clouds Real Neon Freestanding Tabletop Art Sculpture FREE SHIPPING! Coyote and Moon Freestanding Modern Wolf Tabletop Real Neon Art Sculpture FREE SHIPPING! Cool Palm Tree with Blue Moon Real Neon Sign Art Sculpture FREE SHIPPING! Stiletto Shoe Real Neon Freestanding Art Sculpture FREE SHIPPING! Ice Cream Cone Real Neon Art Tabletop Freestanding Sculpture FREE SHIPPING! Sailboat Real Neon Art Tabletop Naval Aquatic Freestanding Sculpture FREE SHIPPING!!! fabulous! love it! it goes so well in our apartment - we're obsessed! great quality work. Wonderful!! We love it. Looks great. Woowww just wowww - im in love with my new sign! I have a Barbie obsession and needed this in my life, no regrets what so ever! A beautiful explosion on top of the fridge! I accept payment through Etsy, which will accept most credit and debit cards. I can also accept Bitcoin on some items; contact me for details. Because of the hand-made, one-of-a-kind nature of my art, I don't offer returns or refunds, but will make good in some way if you are unsatisfied with my work. In regard to the neon art: in the unlikely event that the neon is broken during shipment, you must contact us within 3 business days. We will immediately initiate a claim with the shipper (shipping insurance is always included in the price), and I will also make another piece for you to replace the broken one, and ship it to you as soon as it is completed, at no additional charge to you. Liability – By accepting this Work of Art, the Buyer releases Desert Neon LLC and all its employees from any liability, costs and damages in case of incident of any kind related to the use of the Work of Art. Virtually everything I offer is made to order. Most pieces will take 1-3 weeks plus shipping time. If you order a neon piece, be assured that I have several years experience in packing and shipping neon glass, and my breakage rate is less than 3%. In the unlikely event that the article is broken during shipment, you must contact me within 3 business days. We will immediately initiate a claim with the shipper (shipping insurance is always included in the price), and I will also make another piece for you to replace the broken one, and ship it to you as soon as it is completed, at no additional charge to you. Copyright and Reproduction – Desert Neon LLC reserves all reproduction rights, including the right to claim statutory copyright, in the Work. The Work may not be photographed, sketched, painted, or reproduced in any manner whatsoever in commercial purposes without the express, written consent of Desert Neon LLC. Frankie the Fish Freestanding Tabletop Unique Handmade Real Neon Art Sculpture FREE SHIPPING! Cool Classic Handmade Palm Tree Real Neon 26" High Art Sculpture FREE SHIPPING! Smiley Face Freestanding Tabletop Neon Design Art Sculpture FREE SHIPPING! Purple Saguaro Cactus Neon Freestanding Art Sculpture FREE SHIPPING! Abstract Neon Art Freestanding Tabletop Neon Art Sculpture FREE SHIPPING! Pink Heart with Arrow Freestanding Tabletop Neon Art Sculpture FREE SHIPPING! Japanese Strength Symbol Freestanding Neon Art Sculpture FREE SHIPPING!